Keloids are the result of an overgrowth of dense fibrous tissue that usually develops after healing of a skin injury. The tissue extends beyond the borders of the original wound, does not usually regress spontaneously, and tends to recur after excision. The first description of keloids (recorded on papyrus) concerned surgical techniques used in Egypt in 1700 BCE. Subsequently, in 1806, Alibert used the term cheloide, derived from the Greek chele, or crab's claw, to describe the lateral growth of tissue into unaffected skin. Note the image below. 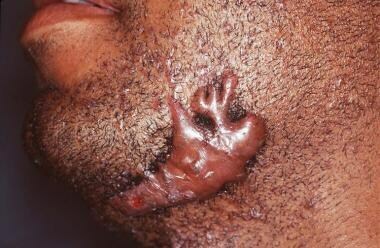 Clawlike outline of a keloid. Courtesy of Dirk M. Elston, MD. Related articles include Laser Treatment of Scars and Stria Distensae, Keloids, and Widened and Hypertrophic Scar Healing. Kischer and Brody declared the collagen nodule to be the identifying structural unit of hypertrophic scars and keloids. The nodule, which is absent from mature scars, contains a high density of fibroblasts and unidirectional collagen fibrils in a highly organized and distinct orientation. In addition, keloids and hypertrophic scars differ from healthy skin by a rich vasculature, high mesenchymal cell density, and thickened epidermal cell layer. Attempts to clinically differentiate keloids from hypertrophic scars have proved to be difficult in the early phases of formation. Clinical differences become more apparent as lesions mature. The most consistent histologic difference is the presence of broad, dull, pink bundles of collagen (hyalinized bundles of collagen) in keloids, which are not present in hypertrophic scars. Keloids rarely resolve spontaneously; however, with treatment, they may become softer, less tender, less painful, and less pruritic. Following excision treatment alone, keloids frequently recur (>50%). Keloids and hypertrophic scars located at most sites are primarily of cosmetic concern; however, some keloids or hypertrophic scars can cause contractures, which may result in loss of function if overlying a joint or in significant disfigurement if located on the face. Advise patients to avoid local skin trauma (eg, skin piercing, tattoos) and to control inflammatory acne. Initially, focus is placed on the alleviation of symptoms. Kischer CW, Brody GS. Structure of the collagen nodule from hypertrophic scars and keloids. Scan Electron Microsc. 1981. 371-6. [Medline]. Luo L, Li J, Liu H, Jian X, Zou Q, Zhao Q, et al. Adiponectin Is Involved in Connective Tissue Growth Factor-Induced Proliferation, Migration and Overproduction of the Extracellular Matrix in Keloid Fibroblasts. Int J Mol Sci. 2017 May 12. 18 (5):[Medline]. Niyaz A, Matsumura H, Watanabe K, Hamamoto T, Matsusawa T. Quantification of the physical properties of keloid and hypertrophic scars using the Vesmeter novel sensing device. Int Wound J. 2012 Dec. 9(6):643-9. [Medline]. Hsu KC, Luan CW, Tsai YW. Review of Silicone Gel Sheeting and Silicone Gel for the Prevention of Hypertrophic Scars and Keloids. Wounds. 2017 May. 29 (5):154-158. [Medline]. Li Z, Dranoff JA, Chan EP, Uemura M, Sevigny J, Wells RG. Transforming growth factor-beta and substrate stiffness regulate portal fibroblast activation in culture. Hepatology. 2007 Oct. 46(4):1246-56. [Medline]. Peyton SR, Putnam AJ. Extracellular matrix rigidity governs smooth muscle cell motility in a biphasic fashion. J Cell Physiol. 2005 Jul. 204(1):198-209. [Medline]. Hayashi T, Furukawa H, Oyama A, et al. A new uniform protocol of combined corticosteroid injections and ointment application reduces recurrence rates after surgical keloid/hypertrophic scar excision. Dermatol Surg. 2012 Jun. 38(6):893-7. [Medline]. Al Aradi IK, Alawadhi SA, Alkhawaja FA. Earlobe keloids: a pilot study of the efficacy of keloidectomy with core fillet flap and adjuvant intralesional corticosteroids. Dermatol Surg. 2013 Oct. 39(10):1514-9. [Medline]. Huang L, Cai YJ, Lung I, Leung BC, Burd A. A study of the combination of triamcinolone and 5-fluorouracil in modulating keloid fibroblasts in vitro. J Plast Reconstr Aesthet Surg. 2013 Sep. 66(9):e251-9. [Medline]. Torii K, Maeshige N, Aoyama-Ishikawa M, Miyoshi M, Terashi H, Usami M. Combination therapy with butyrate and docosahexaenoic acid for keloid fibrogenesis: an in vitro study. An Bras Dermatol. 2017 Mar-Apr. 92 (2):184-190. [Medline]. Torkian BA, Yeh AT, Engel R, Sun CH, Tromberg BJ, Wong BJ. Modeling aberrant wound healing using tissue-engineered skin constructs and multiphoton microscopy. Arch Facial Plast Surg. 2004 May-Jun. 6(3):180-7. [Medline]. Conejo-Mir JS, Corbi R, Linares M. Carbon dioxide laser ablation associated with interferon alfa-2b injections reduces the recurrence of keloids. J Am Acad Dermatol. 1998 Dec. 39(6):1039-40. [Medline]. Lee JH, Kim SE, Lee AY. Effects of interferon-alpha2b on keloid treatment with triamcinolone acetonide intralesional injection. Int J Dermatol. 2008 Feb. 47(2):183-6. [Medline]. al-Khawajah MM. Failure of interferon-alpha 2b in the treatment of mature keloids. Int J Dermatol. 1996 Jul. 35(7):515-7. [Medline]. Davison SP, Mess S, Kauffman LC, Al-Attar A. Ineffective treatment of keloids with interferon alpha-2b. Plast Reconstr Surg. 2006 Jan. 117(1):247-52. [Medline]. Pittet B, Rubbia-Brandt L, Desmouliere A, et al. Effect of gamma-interferon on the clinical and biologic evolution of hypertrophic scars and Dupuytren's disease: an open pilot study. Plast Reconstr Surg. 1994 May. 93(6):1224-35. [Medline]. Kontochristopoulos G, Stefanaki C, Panagiotopoulos A, et al. Intralesional 5-fluorouracil in the treatment of keloids: an open clinical and histopathologic study. J Am Acad Dermatol. 2005 Mar. 52(3 Pt 1):474-9. [Medline]. Nanda S, Reddy BS. Intralesional 5-fluorouracil as a treatment modality of keloids. Dermatol Surg. 2004 Jan. 30(1):54-6; discussion 56-7. [Medline]. Darougheh A, Asilian A, Shariati F. Intralesional triamcinolone alone or incombination with 5-fluorouracil for the treatment of keloid and hypertrophicscars. Clin Exp Dermatol. Mar/2009. 34(2):219-23. [Medline]. Asilian A, Darougheh A, Shariati F. New combination of triamcinolone, 5-Fluorouracil, and pulsed-dye laser for treatment of keloid and hypertrophic scars. Dermatol Surg. 2006 Jul. 32(7):907-15. [Medline]. Manuskiatti W, Fitzpatrick RE, Goldman MP. Energy density and numbers of treatment affect response of keloidal and hypertrophic sternotomy scars to the 585-nm flashlamp-pumped pulsed-dye laser. J Am Acad Dermatol. 2001 Oct. 45(4):557-65. [Medline]. Goldan O, Weissman O, Regev E, Haik J, Winkler E. Treatment of postdermabrasion facial hypertrophic and keloid scars with intralesional 5-Fluorouracil injections. Aesthetic Plast Surg. 2008 Mar. 32(2):389-92. [Medline]. Sadeghinia A, Sadeghinia S. Comparison of the efficacy of intralesional triamcinolone acetonide and 5-fluorouracil tattooing for the treatment of keloids. Dermatol Surg. Jan/2012. 38(1):104-9. [Medline]. Saha AK, Mukhopadhyay M. A comparative clinical study on role of 5-flurouracil versus triamcinolone in the treatment of keloids. Indian J Surg. 2012 Aug. 74(4):326-9. [Medline]. Saray Y, Gulec AT. Treatment of keloids and hypertrophic scars with dermojet injections of bleomycin: a preliminary study. Int J Dermatol. 2005 Sep. 44(9):777-84. [Medline]. Muszynska A, Palka J, Gorodkiewicz E. The mechanism of daunorubicin-induced inhibition of prolidase activity in human skin fibroblasts and its implication to impaired collagen biosynthesis. Exp Toxicol Pathol. 2000 May. 52(2):149-55. [Medline]. Muszynska A, Palka J, Wolczynski S. Doxorubicin-induced inhibition of prolidase activity in human skin fibroblasts and its implication to impaired collagen biosynthesis. Pol J Pharmacol. 1998 Mar-Apr. 50(2):151-7. [Medline]. Muszynska A, Wolczynski S, Palka J. The mechanism for anthracycline-induced inhibition of collagen biosynthesis. Eur J Pharmacol. 2001 Jan 5. 411(1-2):17-25. [Medline]. Espana A, Solano T, Quintanilla E. Bleomycin in the treatment of keloids and hypertrophic scars by multiple needle punctures. Dermatol Surg. 2001 Jan. 27(1):23-7. [Medline]. Bodokh I, Brun P. [Treatment of keloid with intralesional bleomycin]. Ann Dermatol Venereol. 1996. 123(12):791-4. [Medline]. Sandulache VC, Parekh A, Li-Korotky H, Dohar JE, Hebda PA. Prostaglandin E2 inhibition of keloid fibroblast migration, contraction, and transforming growth factor (TGF)-beta1-induced collagen synthesis. Wound Repair Regen. 2007 Jan-Feb. 15(1):122-33. [Medline]. Naeini FF, Najafian J, Ahmadpour K. Bleomycin tattooing as a promising therapeutic modality in large keloids and hypertrophic scars. Dermatol Surg. 2006 Aug. 32(8):1023-9; discussion 1029-30. [Medline]. Aggarwal H, Saxena A, Lubana PS, Mathur RK, Jain DK. Treatment of keloids and hypertrophic scars using bleom. J Cosmet Dermatol. 2008 Mar. 7(1):43-9. [Medline]. Manca G, Pandolfi P, Gregorelli C, Cadossi M, de Terlizzi F. Treatment of keloids and hypertrophic scars with bleomycin and electroporation. Plast Reconstr Surg. 2013 Oct. 132(4):621e-630e. [Medline]. Camacho-Martinez FM, Rey ER, Serrano FC, Wagner A. Results of a combination of bleomycin and triamcinolone acetonide in the treatment of keloids and hypertrophic scars. An Bras Dermatol. 2013 May-Jun. 88(3):387-94. [Medline]. Copcu E, Sivrioglu N, Oztan Y. Combination of surgery and intralesional verapamil injection in the treatment of the keloid. J Burn Care Rehabil. 2004 Jan-Feb. 25(1):1-7. [Medline]. D'Andrea F, Brongo S, Ferraro G, Baroni A. Prevention and treatment of keloids with intralesional verapamil. Dermatology. 2002. 204(1):60-2. [Medline]. Shah M, Foreman DM, Ferguson MW. Neutralisation of TGF-beta 1 and TGF-beta 2 or exogenous addition of TGF-beta 3 to cutaneous rat wounds reduces scarring. J Cell Sci. 1995 Mar. 108 (Pt 3):985-1002. [Medline]. Lawrence WT. Treatment of earlobe keloids with surgery plus adjuvant intralesional verapamil and pressure earrings. Ann Plast Surg. 1996 Aug. 37(2):167-9. [Medline]. Margaret Shanthi FX, Ernest K, Dhanraj P. Comparison of intralesional verapamil with intralesional triamcinolone in the treatment of hypertrophic scars and keloids. Indian J Dermatol Venereol Leprol. 2008 Jul-Aug. 74(4):343-8. [Medline]. Ahuja RB, Chatterjee P. Comparative efficacy of intralesional verapamil hydrochloride and triamcinolone acetonide in hypertrophic scars and keloids. Burns. 2013 Oct 30. [Medline]. Janssen de Limpens AM. The local treatment of hypertrophic scars and keloids with topical retinoic acid. Br J Dermatol. 1980 Sep. 103(3):319-23. [Medline]. Panabiere-Castaings MH. Retinoic acid in the treatment of keloids. J Dermatol Surg Oncol. 1988 Nov. 14(11):1275-6. [Medline]. Kwon SY, Park SD, Park K. Comparative effect of topical silicone gel and topical tretinoin cream for the prevention of hypertrophic scar and keloid formation and the improvement of scars. J Eur Acad Dermatol Venereol. 2014 Aug. 28(8):1025-33. [Medline]. Smith P, Mosiello G, Deluca L, Ko F, Maggi S, Robson MC. TGF-beta2 activates proliferative scar fibroblasts. J Surg Res. 1999 Apr. 82(2):319-23. [Medline]. Prado A, Andrades P, Benitez S, Umana M. Scar management after breast surgery: preliminary results of a prospective, randomized, and double-blind clinical study with aldara cream 5% (imiquimod). Plast Reconstr Surg. 2005 Mar. 115(3):966-72. [Medline]. Chuangsuwanich A, Gunjittisomram S. The efficacy of 5% imiquimod cream in the prevention of recurrence of excised keloids. J Med Assoc Thai. 2007 Jul. 90(7):1363-7. [Medline]. Kim A, DiCarlo J, Cohen C, et al. Are keloids really "gli-loids"? : High-level expression of gli-1 oncogene in keloids. J Am Acad Dermatol. 2001 Nov. 45(5):707-11. [Medline]. Berman B, Poochareon V, Villa AM. An open-label pilot study to evaluate the safety and tolerability of tacrolimus ointment 0.1% for the treatment of keloids. Cosm Dermatol. 2005. 18:399-404. Ong CT, Khoo YT, Mukhopadhyay A, et al. mTOR as a potential therapeutic target for treatment of keloids and excessive scars. Exp Dermatol. 2007 May. 16(5):394-404. [Medline]. Syed F, Sanganee HJ, Bahl A, Bayat A. Potent dual inhibitors of TORC1 and TORC2 complexes (KU-0063794 and KU-0068650) demonstrate in vitro and ex vivo anti-keloid scar activity. J Invest Dermatol. 2013 May. 133(5):1340-50. [Medline]. [Full Text]. Hu D, Hughes MA, Cherry GW. Topical tamoxifen--a potential therapeutic regime in treating excessive dermal scarring?. Br J Plast Surg. 1998 Sep. 51(6):462-9. [Medline]. Mikulec AA, Hanasono MM, Lum J, Kadleck JM, Kita M, Koch RJ. Effect of tamoxifen on transforming growth factor beta1 production by keloid and fetal fibroblasts. Arch Facial Plast Surg. 2001 Apr-Jun. 3(2):111-4. [Medline]. Zhibo X, Miaobo Z. Botulinum toxin type A affects cell cycle distribution of fibroblasts derived from hypertrophic scar. J Plast Reconstr Aesthet Surg. 2008 Sep. 61(9):1128-9. [Medline]. Zhibo X, Miaobo Z. Intralesional botulinum toxin type A injection as a new treatment measure for keloids. Plast Reconstr Surg. 2009 Nov. 124(5):275e-7e. [Medline]. Xiao Z, Zhang F, Cui Z. Treatment of hypertrophic scars with intralesional botulinum toxin type A injections: a preliminary report. Aesthetic Plast Surg. 2009 May. 33(3):409-412. [Medline]. Robinson AJ, Khadim MF, Khan K. Keloid scars and treatment with Botulinum Toxin Type A: the Belfast experience. J Plast Reconstr Aesthet Surg. 2013 Mar. 66(3):439-40. [Medline]. Venus MR. Use of botulinum toxin type A to prevent widening of facial scars. Plast Reconstr Surg. 2007 Jan. 119(1):423-4; author reply 424. [Medline]. Saulis AS, Mogford JH, Mustoe TA. Effect of Mederma on hypertrophic scarring in the rabbit ear model. Plast Reconstr Surg. 2002 Jul. 110(1):177-83; discussion 184-6. [Medline]. McGrouther DA, et al. A Double Blind, Within Patient, Placebo Controlled Trial to Confirm the Efficacy of Juvista (Avotermin) in Conjunction With Scar Revision Surgery for the Improvement of Disfiguring Scars. ClinicalTrials.gov Identifier: NCT00742443. ClinicalTrials.gov. Available at http://clinicaltrials.gov/ct2/show/NCT00742443. Accessed: November 3, 2008. Bush J, Duncan JA, Bond JS, et al. Scar-improving efficacy of avotermin administered into the wound margins of skin incisions as evaluated by a randomized, double-blind, placebo-controlled, phase II clinical trial. Plast Reconstr Surg. Nov/2010. 126(5):1604-15. [Medline]. Bush J, et al. A Double Blind, Placebo Controlled Randomised Trial to Investigate the Scar Improvement Efficacy of a Single Intradermal Application of RN1001 (Avotermin) in Subjects Undergoing Excision of Benign Head and Neck Naevi. ClinicalTrials.gov Identifier: NCT00656227. ClinicalTrials.gov. Available at http://www.clinicaltrials.gov/ct2/show/NCT00656227. Accessed: November 3, 2008. Bush J, et al. A Double-Blind, Placebo-Controlled, Randomised Dose Ranging Trial to Investigate the Efficacy of Two Different Dosing Regimens of Avotermin (Juvista) in the Improvement of Scar Appearance When Applied to Approximated Wound Margins in Healthy Volunteers. ClinicalTrials.gov Identifier: NCT00629811. ClinicalTrials.gov. Available at http://clinicaltrials.gov/ct2/show/NCT00629811. Accessed: November 3, 2008. Gilbert P, et al. A Double Blind, Placebo Controlled, Randomised Trial to Investigate the Efficacy of Juvista (Avotermin) in the Improvement of Scar Appearance in Patients Undergoing Bilateral Reduction Mammaplasty. ClinicalTrials.gov Identifier: NCT00432328. ClinicalTrials.gov. Available at http://clinicaltrials.gov/ct2/show/NCT00432328. Accessed: November 3, 2008. McCollum P, et al. A Dose Response Trial to Investigate the Efficacy of Juvista (Avotermin) in the Improvement of Scar Appearance When Applied to Approximated Wound Margins Following Bilateral Varicose Vein Removal. ClinicalTrials.gov Identifier: NCT00430326. ClinicalTrials.gov. Available at http://www.clinicaltrials.gov/ct2/show/NCT00430326. Accessed: November 3, 2008. Young L. Trial of Juvista (Avotermin) following removal of ear lobe keloid scars. ClinicalTrials.gov. Available at https://clinicaltrials.gov/ct2/show/NCT00469235. Accessed: May 13, 2016. Young V. Exploratory safety of the efficacy and safety of Juvista 250 ng when administered following excision of ear lobe keloids. ClinicalTrials.gov. Available at https://clinicaltrials.gov/ct2/show/NCT00836147. Accessed: May 13, 2016. Young V. Safety of Juvista when administered following excision of ear lobe keloids (RN1001-0093). ClinicalTrials.gov. Available at https://clinicaltrials.gov/ct2/show/NCT00710333. Accessed: May 13, 2016. Nanney LB. Epidermal and dermal effects of epidermal growth factor during wound repair. J Invest Dermatol. 1990 May. 94 (5):624-9. [Medline]. Brown GL, Curtsinger L 3rd, Brightwell JR, Ackerman DM, Tobin GR, Polk HC Jr, et al. Enhancement of epidermal regeneration by biosynthetic epidermal growth factor. J Exp Med. 1986 May 1. 163 (5):1319-24. [Medline]. Epstein JB, Gorsky M, Guglietta A, Le N, Sonis ST. The correlation between epidermal growth factor levels in saliva and the severity of oral mucositis during oropharyngeal radiation therapy. Cancer. 2000 Dec 1. 89 (11):2258-65. [Medline]. Peled ZM, Rhee SJ, Hsu M, Chang J, Krummel TM, Longaker MT. The ontogeny of scarless healing II: EGF and PDGF-B gene expression in fetal rat skin and fibroblasts as a function of gestational age. Ann Plast Surg. 2001 Oct. 47 (4):417-24. [Medline]. Kim YS, Lew DH, Tark KC, Rah DK, Hong JP. Effect of recombinant human epidermal growth factor against cutaneous scar formation in murine full-thickness wound healing. J Korean Med Sci. 2010 Apr. 25 (4):589-96. [Medline]. Shin JU, Kang SW, Jeong JJ, Nam KH, Chung WY, Lee JH. Effect of recombinant human epidermal growth factor on cutaneous scar quality in thyroidectomy patients. J Dermatolog Treat. 2015 Apr. 26 (2):159-64. [Medline]. Viera MH, Caperton CV, Berman B. Advances in the treatment of keloids. J Drugs Dermatol. 2011 May. 10 (5):468-80. [Medline]. Berman B, Garikaparthi S, Smith E, Newburger J. A novel hydrogel scaffold for the prevention or reduction of the recurrence of keloid scars postsurgical excision. J Am Acad Dermatol. 2013 Nov. 69 (5):828-30. [Medline]. Gupta S, Kumar B. Intralesional cryosurgery using lumbar puncture and/or hypodermic needles for large, bulky, recalcitrant keloids. Int J Dermatol. 2001 May. 40(5):349-53. [Medline]. Har-Shai Y, Sabo E, Rohde E, Hyams M, Assaf C, Zouboulis CC. Intralesional cryosurgery enhances the involution of recalcitrant auricular keloids: a new clinical approach supported by experimental studies. Wound Repair Regen. 2006 Jan-Feb. 14(1):18-27. [Medline]. Sclafani AP, Gordon L, Chadha M, Romo T 3rd. Prevention of earlobe keloid recurrence with postoperative corticosteroid injections versus radiation therapy: a randomized, prospective study and review of the literature. Dermatol Surg. 1996 Jun. 22(6):569-74. [Medline]. Akita S, Akino K, Yakabe A, Imaizumi T, Tanaka K, Anraku K. Combined surgical excision and radiation therapy for keloid treatment. J Craniofac Surg. 2007 Sep. 18(5):1164-9. [Medline]. Chaudhry MR, Akhtar S, Duvalsaint F, Garner L, Lucente FE. Ear lobe keloids, surgical excision followed by radiation therapy: a 10-year experience. Ear Nose Throat J. 1994 Oct. 73(10):779-81. [Medline]. Berman B, Frankel S, Villa AM, Ramirez CC, Poochareon V, Nouri K. Double-blind, randomized, placebo-controlled, prospective study evaluating the tolerability and effectiveness of imiquimod applied to postsurgical excisions on scar cosmesis. Dermatol Surg. 2005 Nov. 31(11 Pt 1):1399-403. [Medline]. Kim JH, Kim HJ, Kim YH, et al. The combination of copper bromide laser, a 10,600 nm ablative carbon dioxide laser and intralesional triamcinolone for the treatment of hypertrophic thyroidectomy scars. J Eur Acad Dermatol Venereol. Jan/2012. 26(1):125-6. [Medline]. Wagner JA, Paasch U, Bodendorf MO, et al. Treatment of keloids and hypertrophic scars with the triple-mode Er:YAG laser: A pilot study. Med Laser Appl. 2011. 26:10–5. Alster T. Laser scar revision: comparison study of 585-nm pulsed dye laser with and without intralesional corticosteroids. Dermatol Surg. 2003 Jan. 29(1):25-9. [Medline]. Wilgus TA, Bergdall VK, Tober KL, et al. The impact of cyclooxygenase-2 mediated inflammation on scarless fetal wound healing. Am J Pathol. 2004 Sep. 165(3):753-61. [Medline]. [Full Text]. Conologue TD, Norwood C. Treatment of surgical scars with the cryogen-cooled 595 nm pulsed dye laser starting on the day of suture removal. Dermatol Surg. 2006 Jan. 32(1):13-20. [Medline]. Manuskiatti W, Wanitphakdeedecha R, Fitzpatrick RE. Effect of pulse width of a 595-nm flashlamp-pumped pulsed dye laser on the treatment response of keloidal and hypertrophic sternotomy scars. Dermatol Surg. 2007 Feb. 33(2):152-61. [Medline]. Bellew SG, Weiss MA, Weiss RA. Comparison of intense pulsed light to 595-nm long-pulsed pulsed dye laser for treatment of hypertrophic surgical scars: a pilot study. J Drugs Dermatol. 2005 Jul-Aug. 4(4):448-52. [Medline]. Alam M, Pon K, Van Laborde S, Kaminer MS, Arndt KA, Dover JS. Clinical effect of a single pulsed dye laser treatment of fresh surgical scars: randomized controlled trial. Dermatol Surg. 2006 Jan. 32(1):21-5. [Medline]. Apfelberg DB, Smith T, Lash H, White DN, Maser MR. Preliminary report on use of the neodymium-YAG laser in plastic surgery. Lasers Surg Med. 1987. 7(2):189-98. [Medline]. Akaishi S, Koike S, Dohi T, Kobe K, Hyakusoku H, Ogawa R. Nd:YAG Laser Treatment of Keloids and Hypertrophic Scars. Eplasty. 2012. 12:e1. [Medline]. Mamalis AD, Lev-Tov H, Nguyen DH, Jagdeo JR. Laser and light-based treatment of Keloids--a review. J Eur Acad Dermatol Venereol. 2014 Jun. 28(6):689-99. [Medline]. Chiu LL, Sun CH, Yeh AT, et al. Photodynamic therapy on keloid fibroblasts in tissue-engineered keratinocyte-fibroblast co-culture. Lasers Surg Med. 2005 Sep. 37(3):231-44. [Medline]. Ud-Din S, Thomas G, Morris J, Bayat A. Photodynamic therapy: an innovative approach to the treatment of keloid disease evaluated using subjective and objective non-invasive tools. Arch Dermatol Res. 2013 Apr. 305(3):205-14. [Medline]. Asawanonda P, Khoo LS, Fitzpatrick TB, Taylor CR. UV-A1 for keloid. Arch Dermatol. 1999 Mar. 135(3):348-9. [Medline]. Sasaki T, Holeyfield KC, Uitto J. Doxorubicin-induced inhibition of prolyl hydroxylation during collagen biosynthesis in human skin fibroblast cultures. Relevance to imparied wound healing. J Clin Invest. 1987 Dec. 80(6):1735-41. [Medline]. [Full Text]. Kang S, et al. The Effectiveness Of UVA1 Irradiation In The Treatment Of Skin Conditions With Altered Dermal Matrix: A Controlled, Cross-Over Study. ClinicalTrials.gov Identifier: NCT00476801. ClinicalTrials.gov. Available at http://www.clinicaltrials.gov/ct2/show/NCT00476801. Accessed: November 1, 2008. Kang S, et al. The Effectiveness of UVA1 Irradiation in the Treatment of Skin Conditions With Altered Dermal Matrix: An Open Pilot Study. ClinicalTrials.gov Identifier: NCT00476697. ClinicalTrials.gov. Available at http://www.clinicaltrials.gov/ct2/show/NCT00476697. Accessed: November 1, 2008. Choi CP, Kim YI, Lee JW, Lee MH. The effect of narrowband ultraviolet B on the expression of matrix metalloproteinase-1, transforming growth factor-beta1 and type I collagen in human skin fibroblasts. Clin Exp Dermatol. 2007 Mar. 32(2):180-5. [Medline]. Oiso N, Kawara S, Kawada A. The effectiveness of narrowband ultraviolet B on hypertrophic scar in a patient having an isomorphic phenomenon and vitiligo. J Eur Acad Dermatol Venereol. 2008 Aug. 22(8):1003-4. [Medline]. Varga J, Diaz-Perez A, Rosenbloom J, Jimenez SA. PGE2 causes a coordinate decrease in the steady state levels of fibronectin and types I and III procollagen mRNAs in normal human dermal fibroblasts. Biochem Biophys Res Commun. 1987 Sep 30. 147(3):1282-8. [Medline]. Wirohadidjojo YW, Radiono S, Budiyanto A, et al. Cellular viability, collagen deposition, and transforming growth factor beta-1 production among ultraviolet B-irradiated keloid fibroblasts. Aesthetic Plast Surg. Dec/2011. 35(6):1050-5. [Medline]. Cartier H. Use of intense pulsed light in the treatment of scars. J Cosmet Dermatol. 2005 Jan. 4(1):34-40. [Medline]. Erol OO, Gurlek A, Agaoglu G, Topcuoglu E, Oz H. Treatment of hypertrophic scars and keloids using intense pulsed light (IPL). Aesthetic Plast Surg. 2008 Nov. 32(6):902-9. [Medline]. Arno AI, Amini-Nik S, Blit PH, et al. Effect of human Wharton's jelly mesenchymal stem cell paracrine signaling on keloid fibroblasts. Stem Cells Transl Med. 2014 Mar. 3(3):299-307. [Medline]. Berman B, Viera MH, Amini S, Huo R, Jones IS. Prevention and management of hypertrophic scars and keloids after burns in children. J Craniofac Surg. 2008 Jul. 19(4):989-1006. [Medline]. Lee WJ, Song SY, Roh H, Ahn HM, Na Y, Kim J, et al. Profibrogenic effect of high-mobility group box protein-1 in human dermal fibroblasts and its excess in keloid tissues. Sci Rep. 2018 May 30. 8 (1):8434. [Medline]. Zhao YX, Ho CK, Xie Y, Chen YH, Li HZ, Zhang GY, et al. Calcimycin Suppresses S100A4 Expression and Inhibits the Stimulatory Effect of Transforming Growth Factor β1 on Keloid Fibroblasts. Ann Plast Surg. 2018 May 24. [Medline]. Zhang Y, Guo B, Hui Q, Li W, Chang P, Tao K. Downregulation of miR‑637 promotes proliferation and metastasis by targeting Smad3 in keloids. Mol Med Rep. 2018 May 29. [Medline]. Histology of keloid demonstrating central zone of hyalinized collagen (hematoxylin and eosin stain). Courtesy of Dirk M. Elston, MD. Histology of keloid demonstrating thick hyalinized collagen bundles (hematoxylin and eosin stain). Courtesy of Dirk M. Elston, MD. Disclosure: Serve(d) as a director, officer, partner, employee, advisor, consultant or trustee for: Aclaris; Bifrontera; Aiviva; Pulse; Celumigen; Dermira; DUSA Sun Pharmaceutical; Exeltis, Ferndale; Galderma; GSK; Halscion; Klara; Leo; Medimetriks; Miragen; Novan; Novartis; Smith & Nephew; TopMD; Valeant Pharmaceuticals; Anacor; Aclaris; Menlo;<br/>Serve(d) as a speaker or a member of a speakers bureau for: Sun; Exeltis, Ferndale; Galderma; GSK; Halscion; Leo Pharmaceuticals; Medimetriks; Miragen; Novan; Novartis; Valeant Pharmaceuticals; Anacor; Clark; Aclaris; Sensus<br/>Received research grant from: Celumigen; Dermira; DUSA; Exeltis, Ferndale; Galderma; Leo; Menlo; Anacor; Clark; Pulse; Miragen; Sensus<br/>Received income in an amount equal to or greater than $250 from: Bifrontera; Aiviva; Pulse Biosciences; Dermira; DUSA; Sun; Menlo; Sirnaomics; Exeltis, Ferndale; Galderma; GSK; Halscion; Leo; Medimetriks; Miragen; Novan; Novartis; Smith & Nephew; TopMD; Valeant Pharmaceuticals; Anacor; Clark; Aclaris; Sensus. The authors and editors of Medscape Reference gratefully acknowledge the contributions of previous author Whitney Valins, MD, to the development and writing of the source articles.